A new computer game designed by a researcher at Newcastle University could help to create CAPTCHA systems immune to attack from AI bots. Dr Jeff Yan's Magic Bullet game turns the validation of CAPTCHA characters into an online game. He hopes that it will help companies stay one step ahead of spammers, hackers and online criminals. 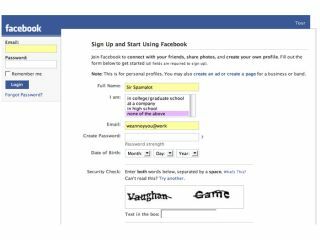 CAPTCHA (Completely Automated Public Turing Test to Tell Computers and Humans Apart) is widely used by websites such as Google and Facebook to defend against malicious bots that spread junk emails or grab thousands of free email accounts. New CAPTCHA systems have to be developed all the time, as spammers are always trying to crack existing systems. Every innovation has to be manually checked against both human and computer users, to check that the distorted words and numbers are legible to genuine users while confusing automated bots. To fully evaluate the robustness of a CAPTCHA scheme, at least 10,000 segments usually have to be labelled. "Manually labelling samples is tedious and expensive," explained Dr Yan. "For the first time, this simple game turns it into a fun experience with a serious application as it also achieves a labelling accuracy of as high as 98 per cent." Magic Bullet is an online shooting game where teams of two players are randomly pitched against each other. During each round, a randomly chosen segmented CAPTCHA character appears and will shoot towards the target only when both players correctly identify it before their opponents. "An average game session produced 25 correct labels per minute, giving 1,500 per hour," explained Dr Yan. "As this game supports a large number of parallel sessions, which are limited only by the network bandwidth and game server's CPU and memory, there is also a lot of scope to increase the labelling rate dramatically." We'll let you know where you can play Magic Bullet when the final game goes live.